I mentioned in my last post that you have to choices to make- what type of diapers, and then we to start using what type of diaper. Both of those questions will help you make a choice on which diapers to purchase and when to purchase. At first I was going to wait till he a was a bit older to start but I under the illusion I am going to start when he is a few weeks old. This means that I will have to have to stashes- one for a newborn and then one as he gets bigger when he can use the one size diapers. If I was a reasonable pregnant women I would choose the really great option and deal offered through Jillians’s Drawers. They have two package deals that you can choose from. One is for newborns– the cost is around $155, but you can return it all, yes used, if you are not happy with it, and only pay $10. But I am not a reasonable pregnant women and the choices for the diaper covers and diapers are just not that cute in the trail bundle they offer… so I am opted to make my own stash. The low-down: Most newborn sized diapers will fit till around 15 lbs. When your little hits that size is not set, but it is guessed that it is between 2-3 months. How long each diaper will fit depends not just on the weight but on the overall size for each diaper maker. Each diaper maker will have a slightly different thigh measurement and rise length. All-in-Ones: I picked up two pack of Lil Joeys from our local shop Franklin Goose ($29.95). They have super cute robots on them! How could I not pick these guys up. From what I have read on review boards, these are really the best diapers for newborns. I am not doing too many of these since they are really tiny diapers and of course the cost is a bit high for how long he will be in them. They will fit up to 12 lbs. Fitted: I bought 4 Kissaluvs ($13.95 each for a total of 55.80) size 0. Once again the cost of these for such a short period of time so it seems hard to want to spend that much money on them. They will last till he is about 15 lbs. If you really want to save money you can easily find these used on Diaper Swappers for a reduced price. You have to use these with Diaper Covers. Prefolds: Hands down the cheapest option out their. You can purchase 12 for $15. You just place these in diaper covers making this the most affordable option. 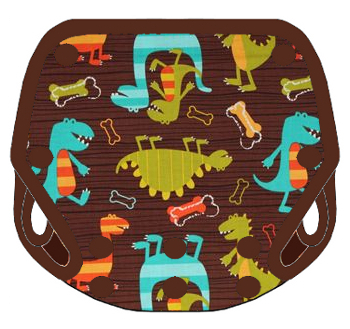 What are also great about prefolds is that you can use them for things like burp cloths as well. Waterproof Diaper Covers: Recommended covers are 6-8 to use covers full-time. But since I have 2 Lil Joeys I only have 4 diaper covers. I love Gen-Y Diaper Covers and got three different patterns in extra small, each $16.99. They will last till he is around 15 lbs. I also purchase 1 Weehuggers Diaper Cover for $18.95. Washing: Every day and a half. Cost for disposable diapers per week: $25 (if diapers are around .30 each. Which you can pay less, or you can pay more). Cost for 8 weeks of disposable diapers (about what I can expect the newborn size to work, give or take a few weeks): $200. Obviously I did not calculate the cost to run the washer and dryer, and detergent. But as far as the basic numbers go, my current choices for my newborn cloth diaper stash aren’t really going to save me money, unless of course we have another child! Good news is that I am not really using cloth to save a ton of money (or time! ), I like the idea of them and like the fact that they are better for little ones skin. Plus they are so much cuter than disposable! How to save money on your Newborn Stash? And/or try skipping the Fitted and All-in-Ones. This will cut out a huge chunk of money. If I were to buy another package of prefolds instead of having the Fitted and All-in-Ones, I could save $70.75. Making the total cost for the newborn stash under $100. Making the total savings for cloth over disposable over $100! Don’t forget you can sell your stash and recoup some of the cost. If I sold my stash in good to excellent condition, I could possibly get back up to 50% of the cost of the stash!